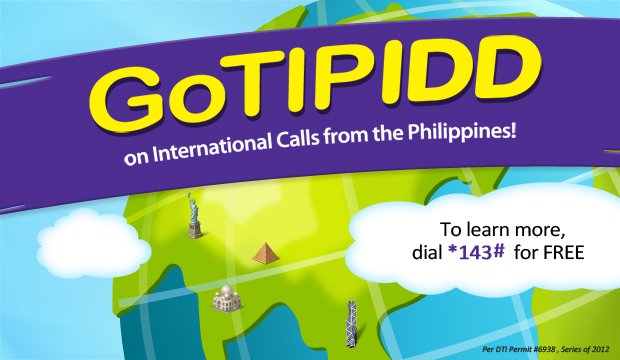 Globe Telecom is offering their lowest per minute IDD rates on international call from Philippines. GoTIPIDD is a promo offer from Globe to all their prepaid subscribers to enjoy discounted IDD call rates in a hassle free way. Registration to this promo is now made easy as there is no need for you to buy a tipIDD card, just load up your sim and you are ready to avail this promo straight from you phone. To register you may find keywords or code below. 3.Choose from options 2,3 and 4.
hi. it should be like this??? 109173456769 or like this? 00109173456769? how to dial Thailand please?? What about dialling to saudi how is it to be dialed? How to register Golobe tipIDD card. I follow the instruction at back but it didn't work..can please someone tell me how to reg. I dial 1286 and it says I dont have enough balance, which in the first place,that is why i bought this card. Thanks for posting this. It really worked!